Overall Size: 33 1/4" x 21 1/4"
On the night of 16 / 17 May 1943, in one of the most daring low-level missions of the war, the men of newly-formed 617 Squadron, under the command of Guy Gibson, attacked the great dams of the Ruhr. The story of their audacious raid gained the squadron immediate fame and thereafter they would be known simply as the ‘Dambusters’. But for the hundreds of airmen who followed in their footsteps, the destruction of the great dams was merely the beginning for this new squadron of low-flying, precision-bombing experts. Over the next two years their courageous exploits would earn the respect of the world. They did so under the command of some of Bomber Command’s greatest leaders. Following in Gibson’s footsteps were men such as the inspirational Leonard Cheshire VC, described by the London Gazette as having ‘a reputation second to none in Bomber Command’, and who helped pioneer precision target marking and the accurate delivery of Barnes Wallis’s new deep-penetration ‘earthquake’ Tallboy bombs, especially in the operations against V-weapon sites in northern France. Cheshire’s worthy successor was James Tait, who led the raids against the Tirpitz and whose Tallboy bomb eventually sank the mighty German battleship. In December 1944, having completed over 100 operations, Tait handed over the reins to Canadian Jimmy Farquier – described as probably the finest bomber pilot in the RCAF – and the man who would lead 617 Squadron until the last raid of the war. 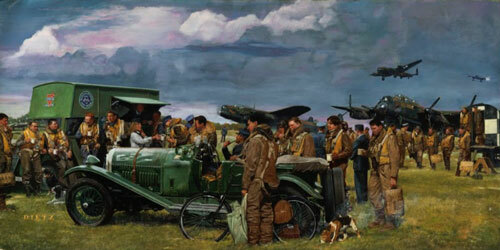 Under his stewardship the airmen of 617 Squadron were to reach new heights of fame, delivering Tallboy’s massive big brother – the Grand Slam – Barnes Wallis’s pièce-de-résistance, a 22,000lb bomb whose warhead contained over 9,000lbs of explosive, making it the most powerful conventional bomb of World War II. In the capable hands of 617 Squadron’s specially modified Lancasters, they destroyed targets such as the great Arnsberg and Bielefeld viaducts, and the seemingly indestructible Valentin U-boat pens on the banks of the River Weser, whose huge 15ft walls supported a roof that in places was 23ft thick. The squadron flew their last mission of the war on 25 April 1945, their Tallboys helping to destroy much of Hitler’s once-fabled mountain retreat at Obersalzberg.